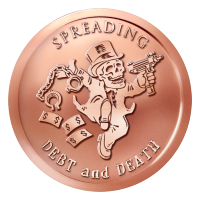 Spreading Debt and Death is the second coin in the "Rise and Fall of the Banksters" sub-series in the Silver Shield Series. This design tackles a reality familiar to any student of history. The power of war is not the destruction it causes or the armies it raises but rather the debt it creates. By pushing and creating the conditions for one, banksters are able to create and control through the other. The Spreading Debt and Death Bankster round captures this idea perfectly. The obverse features a design by Heidi Wastweet that shows a skeletonized tycoon in a top hat, a merchant of death as it were, and the wares that he peddles. By creating war as illustrated by the machine gun in his left, the bankster is able to create debt and servitude as illustrated by the shackles in his right hand. The money trailing behind him is the vehicle used to bring about the "heyday" of the bankster's power as illustrated by the "prancing" attitude and smile that are both clearly visible. He is surrounded by the engraved words "Spreading Debt and Death". This design shows one of the craftiest truths of the modern world and features the banksters at the height of their power, war profiteering. Power through destruction and debt servitude. This is the second design in the four part miniseries. 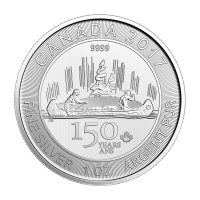 Each coin will only be available for a limited time. Obverse A skeletonized tycoon in a top-hat prancing along with shackles in his right hand, and a machine gun in his left while dollar bills trail behind him, and the words "Spreading Debt and Death"
A skeletonized tycoon in a top-hat prancing along with shackles in his right hand, and a machine gun in his left while dollar bills trail behind him, and the words "Spreading Debt and Death"
1 oz 2015 Spreading Debt and Death Bankster Copper Round Spreading Debt and Death is the second coin in the "Rise and Fall of the Banksters" sub-series in the Silver Shield Series. This design tackles a reality familiar to any student of history. The power of war is not the destruction it causes or the armies it raises but rather the debt it creates. By pushing and creating the conditions for one, banksters are able to create and control through the other. The Spreading Debt and Death Bankster round captures this idea perfectly. The obverse features a design by Heidi Wastweet that shows a skeletonized tycoon in a top hat, a merchant of death as it were, and the wares that he peddles. By creating war as illustrated by the machine gun in his left, the bankster is able to create debt and servitude as illustrated by the shackles in his right hand. The money trailing behind him is the vehicle used to bring about the "heyday" of the bankster's power as illustrated by the "prancing" attitude and smile that are both clearly visible. He is surrounded by the engraved words "Spreading Debt and Death". 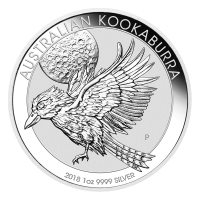 The reverse shows the revised Silver Shield logo with the trivium in the centre encircled by the words "Silver Shield 1 AVDP ounce 2015 999 Pure Cu" surrounded by 47 bullets. This design shows one of the craftiest truths of the modern world and features the banksters at the height of their power, war profiteering. Power through destruction and debt servitude. This is the second design in the four part miniseries. Each coin will only be available for a limited time.